I’m not a wreck diver. So when my friend first asked me to join him on a dive trip to North Carolina, I was unexcited. Then, stories of wrecks covered in colorful soft corals and packed with fish life sparked my interest. 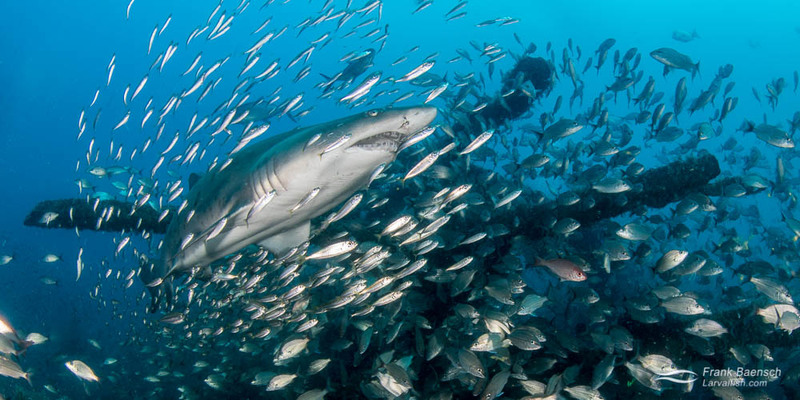 But it was the dazzling images of sand tiger sharks covered in baitfish that finally got me to book my trip to Morehead City. Located close to the warm, nutrient-rich waters of the gulf stream; the wrecks of North Carolina have developed into productive artificial reefs. The best wrecks lie 15-20 miles off-shore and require 2–3 hour boat rides. The area is prone to rough seas, poor visibility and strong currents. Olympus Diving has large, comfortable boats and the practical knowledge to tackle these challenges. Divers photograph a massive school of Atlantic spadefish (Chaetodipterus faber) above a wreck in North Carolina. Gag grouper (Mycteroperca microlepis) aggregating on a deep wreck in North Carolina. Fisheye view of a massive school of Atlantic spadefish (Chaetodipterus faber) in North Carolina.